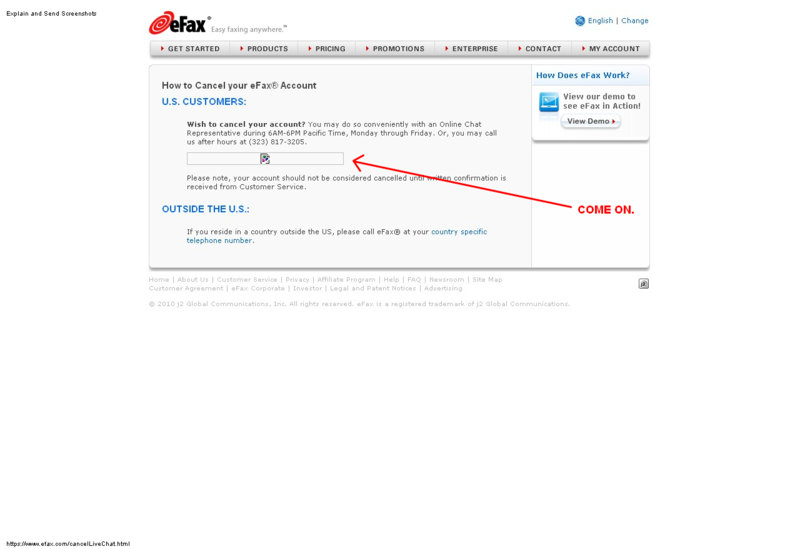 watched pots | news: What a pain it is to cancel an eFax subcription. 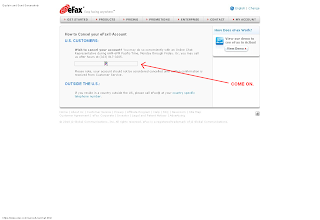 I know I kinda ask for this kind of treatment by seeking out a free trial of a service that I plan to use once and then cancel, but I just tried to cancel my membership to eFax and I'm wishing I never got involved with them in the first place. Not only is the image broken there, the link is too. Click it all damn day. It won't work. And then I had the following conversation (Note: I did not actually buy a fax machine as I indicated in my reason for leaving; I just thought that would be the option least likely to prompt a save response offering me a discount -- I was wrong). Please wait for a site operator to respond. You are currently number 1 of 1 in the queue. Thank you for your patience. Matthew: Welcome to our sales chat. How may I help you? Matthew: You have clicked on “Live Sales Chat” and have reached the sales department. 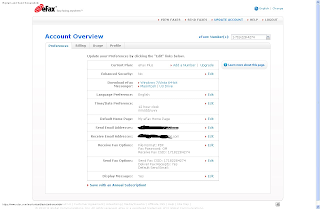 We are only able to setup new accounts and have very limited access to existing accounts. If you need to cancel, we have a special support team to take care of that. Please wait while I transfer the chat to 'Beth C.'. Beth C.: Hello, Mike. 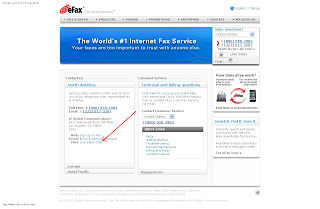 Welcome to eFax online support. I am Beth, your online Live Support Representative. How are you doing today? Beth C.: I will be glad to assist you with the cancellation request via this chat session. Would you like to proceed? Beth C.: Could you please provide me your fax number, registered email address and billing zip code for verification? Beth C.: Thank you for providing your information. Please give me a moment while I pull up your account. Beth C.: Mike, as we'd like to keep your business, I can offer you a plan that will let you keep your eFax service for just 14 cents a day. Beth C.: You make one annual payment of just $50 and pay nothing more unless you exceed 30 pages per month. Extra pages are just 15 cents. This deal won't be available once your account is closed. Can I switch you to this savings plan which lets you keep your fax number for just 14 cents a day? Mike: no thank you, I just want to close the account. Beth C.: OK, I will go ahead and cancel your account. Beth C.: Is there anything else, I may assist you with? Mike: is there a confirmation number? Beth C.: Sure. 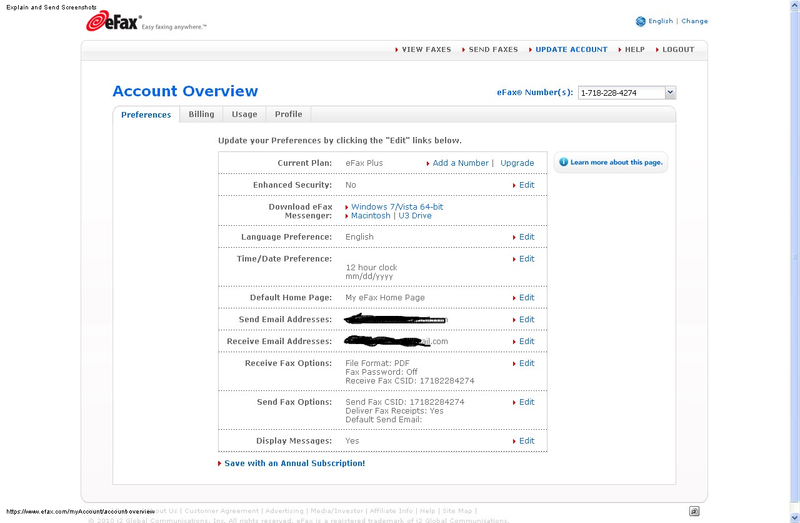 An email confirmation will be sent at your registered email address. Beth C.: Thank you for contacting eFax online support. I hope you found our session helpful. Goodbye and take care. Of course, I still haven't received my confirmation about an hour later, and I have been back to the site to make these screenshots (including accessing the "My Account" page) since that conversation. At this point I'm doubtful that eFax has any intention of allowing me to cancel my account without actually getting on the phone and talking to someone. It's not a really big deal, obviously. I've got the time to do it. But I can imagine there are plenty of people who don't, and who therefore let a few $16.95 monthly bills pile up for a service they don't use before they finally get around to navigating this system. Really makes me think I should have just found a local place and spent the $0.30 it probably would have cost me to send the one fax I've needed to send in years. I've done a little Googling since I wrote this all down, because I was feeling guilty about posting this only an hour after the fact, and thinking that maybe I should give the poor folks at eFax a break. Turns out, of course, I'm not the only one who's had a problem. Conclusion: F these guys. Don't get involved with them. In the end, I did get a confirmation email about 3.5 hours after I posted this. So, in fairness to Beth C., she was good for her word. The whole process still left me feeling resentful, though.